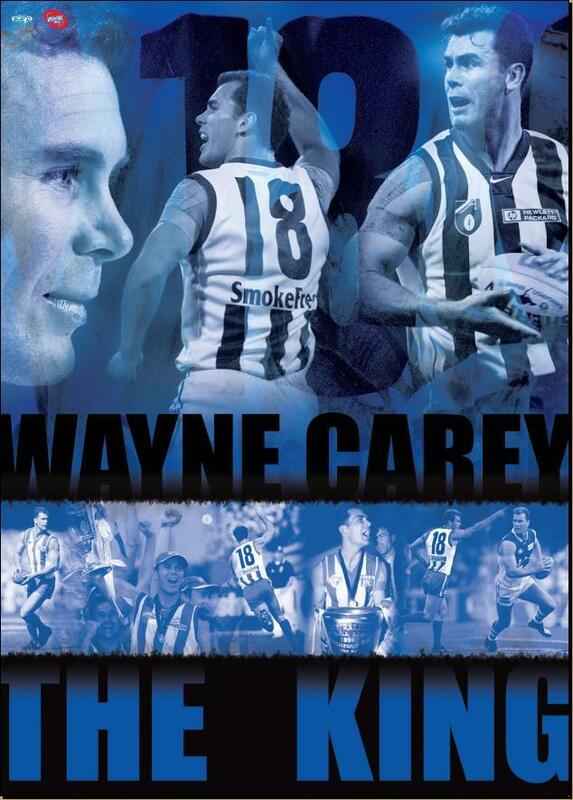 Wayne Carey will be in Port Moresby for AFLPNG's season launch dinner on the 16th of April. 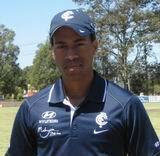 Dual Premiership Captain at North Melbourne, four time club best and fairest and seven time All Australian, Carey, nicknamed "The King", is generally considered to be one of greatest players to have ever played Australian Football. 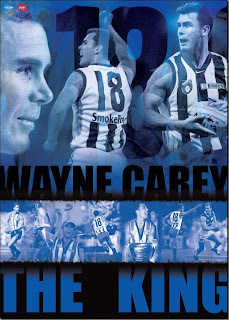 In 2001 he was named as Centre half forward and captain of North Melbourne's Team of the Century and in 2008 Wayne Carey was named as Australian Football's greatest ever player as part of a list of the top 50 players of all time, published in the book 'The Australian Game of Football', which was released by the AFL to celebrate 150 years of Australian Football. In 2009, The Australian nominated Carey as one of the 25 greatest footballers never to win a Brownlow medal. THEY play for the Coolangatta Blues but it looks more like the Papua New Guinea Aussie rules national team. Fresh off a wooden spoon last year, new Blues president Scott Reid, who is also the president of AFL-PNG, has secured the services of 10 players from PNG to boost the club. John Vogae, Ogla Pena, Freddie Peni, Emmanuel Tupia, Junior John Ikupu, Ferdinand Musi, Ali Pinda, Paul Phillip, Gagu Kaiyage and Junior Henry will all play for the Blues this season. 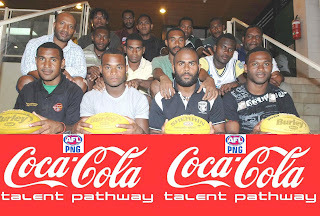 AFL PNG, which has been funded by the AFL for almost 10 years, have had players in Queensland on scholarship as part of its Coca Cola Talent Program for several years. Coolangatta is a partner club and more than happy to accommodate the players, who range from the age of 17 to 24, from PNG for 2010. "They bring a lot of run and fitness and with their attitude they are great to have around because they enjoy their footy," said Reid. Reid said the boys have already fit right in down at Len Peak Oval. "One of the things we are a little bit conscious of is we are bringing so many in to Coolangatta and you can sometimes set up a bit of a divide if the PNG boys stick to themselves." he said. "But Coolangatta has a lot of new players and they are mixing really well with the PNG boys." AFLPNG Coca Cola Talent Path Scholarship Participants left town last Friday 12th of February to take up places in Queensland Australia. With the Coca Cola Talent Path Program already producing 5 AFLPNG players now listed to AFL Clubs the 12 unattached players sent down on Australian based scholarships will already know that he AFL has already coming knocking on PNG doors. Ogla Pena (Western Highlands), Freddy Peni (New Ireland), John Vogae (West New Britain), Emmaus Wartovo (East New Britain) and Emmanuel Tupia (West New Britain) will be based out of the Gold Coast. Ferdinand Musi (East Sepik), John Ikupu (Eastern Highlands) will start their campaign from Townsville for the Queensland Country, Greg Aki (Western Highlands) and Larry Nao (Gulf) will base from the Sunshine Coast. Naime Gordon (Central) and Collins Slim (Oro) will be at the Northern Raiders in Brisbane and Amua Pirika (Central) and John James (NCD) will be based out of Brisbane. The Coca Cola Talent Path has already put through to the AFL, David Meli to the Essendon Bombers, Peter Labi to the Carlton Blues, Donald Barry to the Brisbane Lions, and Stanis Susuve to the new Gold Coast Franchise. And the rumour mill has it that AFLPNG will announce that the Coca Cola Path will now have a staggering 10 participants signed to AFL Clubs by the month end. The Coca Cola Talent Path is certainly a tried and tested model that has seen real results over the last 8 years from the Talent Camps right through to the Coca Cola Binatangs tours each year. 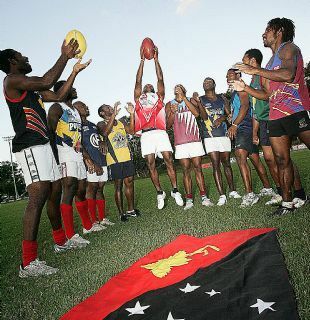 With the AFL Clubs now committing to in country development and talent search PNG is poised no doubt to see more kids joining the ranks in AFL Clubs. In a nail biting finish to Series One of the 2009/2010 AFLPNG BSP Super Series, Komatsu Bulldogs showed true grit to win by 8 points from the Kwila Insurance Cats. It was the Amua Pirika show in the first quarter of the game with the young Brisbane Lions bound forward banging home three goals out of the four for the Kwila Cats to take the lead twenty five points to two. But a determined Bulldogs living up to their Komatsu Tough brand showed they were certainly tough enough matching the Kwila Cats with some hard running by there midfield. Dominic Livuana and Freddy Peni set the ground alight for the bulldogs with their speed through the middle as Garry Kele brought the house down with a long range goal for the Bulldogs to win the second quarter for them and keep them in the game. Anega Issac and Bobby Oreki for the Cats showed why they were part of the Mozzies and Binatangs system as they stepped up a gear to hold down a Bulldogs fight back. Oreki showing great strength in holding out former Richmond Tigers backman come Bulldogs forward Ray Hall. Collin Wilshire and Charlie Arua played hard for the Kwila Cats while young Jackson Holee gained good possession for the Cats through the middle of the ground. At three quarter time the games was set to go down right to the wire with the Kwila Cats only holding a narrow three point lead, 44 point to 41. The fourth quarter of the Series One final lived up to expectations as the crowed watched determined hard fought football as both sides threw all they had at each other. With both Coaches biting their nails from the sidelines the Cats looked to seal the Series early in the fourth quarter with defiant goals to Amua Pirika and Charlie Arua. But a three goals haul by the Bulldogs pegged back the Kwila Cats and saw them take out the Series 60 points to 52. The Komatsu Bulldogs taking home a thousand reasons to “Love their Bank” with a BSP cheque presentation by AFL Asia Pacific Manager Andrew Cadzow. There was all the more reason to celebrate the Series One Final for all four teams as Andrew Cadzow announced that after the second Series in January a Representative side will be picked to participate in the AFL Cairns pre-season competition. This would be a real opportunity to see the dynamics of having a PNG based side play regularly in either AFL Cairns or the AFL Queensland State competition. The BSP Super Series Two will start January 23rd 2010. These young lads, from the suburb of Waigani in Port Moresby, heading to the Coca Cola National Talent Camp have already packed there bags for the National Sport Institute in Goroka for the December camp. Hard at training on a Tuesday night, the lads are putting in that extra effort to give themselves the best chance for next years representitive duties and potential talent scholarships on offer. The news that AFL Club Recruitment personnel may be part of the 3 day camp will certainly boost a determined pack of the top 110 players who have participated in the Bemobile "Raitman" Schools competitions. The Coca Cola Talent Camp is the 3rd step in the Coca Cola Talent Path which has the ability to take participants all the way into the AFL. In the coming week AFLPNG and Marie Stopes PNG will announce a partership that will see a strong cooperative effort between the two organisations. This now means that AFLPNG's Bemobile Game Development community and lifestyle awareness initiatives will have more bite with Marie Stopes PNG partnering to offer accessible services to program participants. AFLPNG certainly understands the real need for youth in PNG to be aware of lifestyle choices they make and this will be a key partnership in empowering our participants. Our very own Peter Labi and David Meli have journeyed down to Melbourne in the last week to begin there push for the AFL. Peter Labi has signed up to Carlton for the next two seasons and has already begun training with the Blues. David who is also on a two year term with Essendon, made the journey down to Windy Hill this week and will soon be wearing the Bombers Red and Black out on the training track. The lads will hopefully update us on how they are going through pre-season.